Cancellation, no show or reduction in numbers within 3 days of arrival will result in payment being taken from your card for the first nights accommodation. 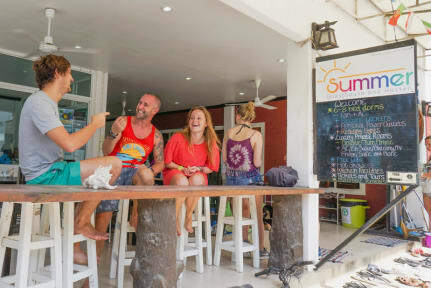 With a large common area, designated smoking areas, hot showers and both air conditioned & fan dorm rooms our guests achieve privacy and comfort without great expense, Summer Hostel has everything you need to relax, unwind and enjoy Koh Tao. We have three 6-bed air-con dorm rooms all with an en-suite and hot shower. 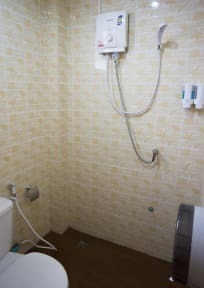 We then have one 6-bed air-con dorm and one 8-bed fan dorm that share purpose built bathroom facilities with multiple toilets, hot showers and sinks. Each bed is equipped with a personal light and power socket for charging phones/laptops etc. Secure lockable lockers are provided for personal belongings as well as 24 hour CCTV security. Free high speed wifi is available to all guests. Our multilingual staff are available 24 hours a day everyday to help answer any questions you may have. We can arrange all your island activities including Thai cooking classes, Scuba Diving, Snorkeling, Paddle-boarding and more. We also offer a wide range of ticket and travel services. - There is no minimum age for the private rooms. - We can provide cots and extra beds for children upon request at a charge of THB400 per night. - The minimum age for the dorms is 16 years old. I straight up loved Summer Hostel. I had the most amazing time and continued to extend my stay. Bells and Izz are such amazing hosts. Nicky, who owns the hostel is so wonderful too. Summer was honestly the best hostel I visited in Thailand. Some of the best and most inexpensive restaurant spots are just down the street too. I loved Koh Tao, can’t wait to go back, and will stay here again when I do. It was the hardest place to leave because of all the amazing people I met. See you guys soon! Awesome hostel a short walk from the main street. Very social laid back vibe where everyone chills together in the common area on the patio. There's a 24/7 market literally in front of the hostel so that also helps. Also can't insist enough on how nice the owner is as she made my diving classes possible by finding a dive center willing to accept me an hour after classes started and drove me there herself to make sure I make it. This was a really enjoyable stay! my group didn't want to join a massive group tour, so the manager here was able to hire us a privately chartered longtail boat to take us to a modified snorkelling trip. The stay was comfortable, and there are quite a few food options in town. Friendly hostel, overall good place to stay. Decent location, a bit of a walk to the main strip and beaches but there is a super mart right across the street. The lockers are not big enough to fit your bag, however I just emptied mine and used my lock to lock my stuff up inside of it. Summer hostel was a bit crowded and even though it says it was a quiet hostel and out of the way it wasn’t really as people were always awake. On arrival, whoever checked us in didn’t seem to care to make us feel welcomed. However, Nicki was lovely and she made up for the attitude of the woman on the front desk. The lockers weren’t big enough for big rucksacks but you could fit your important documents in there so that was good. Overall, it was a nice stay and you get what you pay for. We stayed in a double private room which was more like a hotel room, very clean, big bed with free water, teas and coffees. The only problem we had was with the air conditioning. Ours wasn’t working, only blowing out hot air so our room was boiling. They called an engineer who fixed it but it still kept turning off every 15mins or so but atleast the room was cool. A little out of the main town, but opposite a supermarket and you can rent motorbikes for cheap and also snorkels. It nice enough and the staff were quite friendly but the 6 bed room was so tiny. The fans made a terrible squeaking noise all night and the air con wasn’t enough to keep it cool even after asking them to make it colder. Then there was the unfriendly cleaning lady’s who just come into the room and bang and clatter quite early then slam the door. Try and smile and be friendly to them and they have a look of pure hate plastered on their face. We went to Taco shack down the road.